German composer and music teacher; born at Breslau, Prussia, Aug. 13, 1831; pupil at the Breslau gymnasium and of Hesse (pianoforte), Lüstner (violin), and Brosig (harmony). In 1848 he entered the Leipsic Conservatorium, which, however, he left after a year in order to study with Liszt at Weimar. Here he advanced rapidly, and eventually became a virtuoso of no mean ability. After a private course in composition under Hauptmann, Jadassohn in 1852 settled in Leipsic as a teacher of music. In 1866 he became conductor of the Psalterion Choral Society, and from 1867 to 1869 was director of the Euterpe concerts. Since 1871 he has been professor of harmony, composition, and instrumentation at the Conservatorium; and his treatises on these subjects are considered among the best. 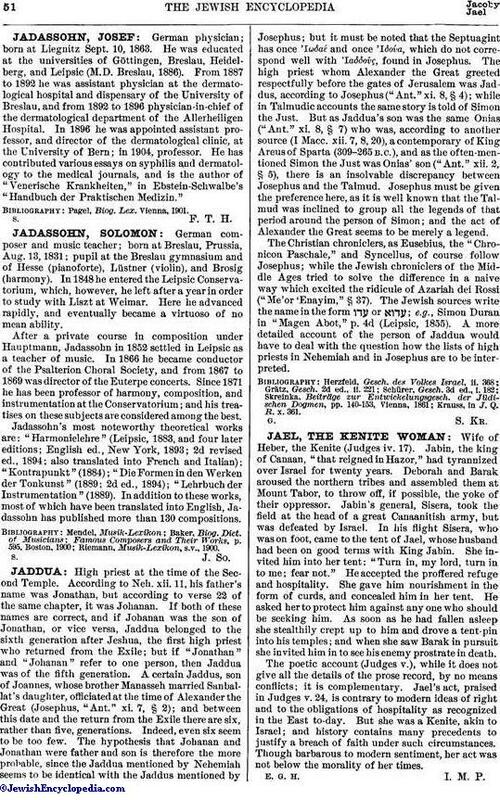 Jadassohn's most noteworthy theoretical works are: "Harmonielehre" (Leipsic, 1883, and four later editions; English ed., New York, 1893; 2d revised ed., 1894; also translated into French and Italian); "Kontrapunkt" (1884); "Die Formen in den Werken der Tonkunst" (1889; 2d ed., 1894); "Lehrbuch der Instrumentation" (1889). In addition to these works, most of which have been translated into English, Jadassohn has published more than 130 compositions.